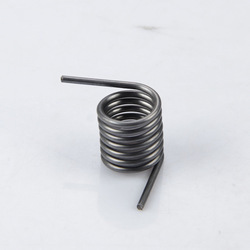 We manufacture wide range of Torsion springs matching the industrial demands. Our custom Torsion Springs are useful for extensive industrial applications. 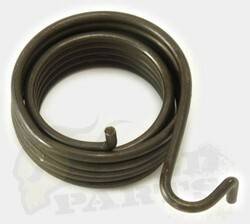 We supply all types of springs at very competitive prices. We provide Small Torsion Springs that generate a force or torque. As the arms rotate about a central axis, it produces a force in a circular arc. 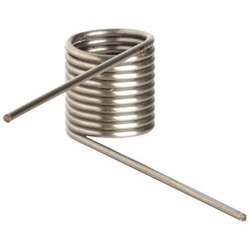 The torsion spring mainly has two ends of which one is in the fixed position and the other end is pulled to exert same force in either clockwise or anti clockwise. Our organization offers left or right hand springs and single & double torsion springs. We are instrumental in offering a wide assortment of Stainless Steel Torsion Springs that is widely used for reducing vibrations and jerks. The Stainless Steel Torsion Springs manufactured by us are qualitatively superior and highly reliable. They are high-quality corrosion-resistant springs that are used in various sanitary products. We are one of the eminent names of the market engaged in offering a high quality range of Double Torsion Springs to the customers. These products are manufactured using high-grade raw material procured from the trusted sources of the market. In addition to this, we can deliver the ordered products at the client's end within the committed time frame. We are offering a wide range of Heavy Duty Torsion Springs which find their use in automobile industry. The amount of force exerted by this spring is proportional to the amount they are twisted. These springs are manufactured ideally for applications where high loads are needed and limited space is available. Note :- The Prices of the products are approximate and it will vary according to the requirements of the clients. We offer superior quality Custom Helical Torsion Springs, which are precisely engineered to suit diverse customer requirements. 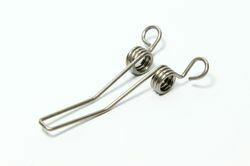 The amount of force exerted by these springs is proportional to the amount they are twisted. These springs are available in various sizes and offer resistance to externally applied torque. Manufactured using quality raw material, these can be customized as per the requirement of our clients. Finish: zinc, nickel, silver, gold, copper, colored, etc. Material: Steel,stainless steel, carbon steel, etc.